1. 63% of children do not like to share anything, which is a shocking figure as social skills at such a young age are already about fulfilling individual needs and therefore their personality will have more shades of selfishness. 2. 73% of children would rather share with friends than with siblings highlighting weak family attachments. 3. A trend of alienation and lack of social skills was noted as 55% responded that they would rather spend time with screens than reading or with friends. 4. When asked how they will react if they see a bird lying on the ground wounded, 45% of children answered with a shrug and ‘what can I do?’ Not only that, 68% admitted to have hurt animals either by throwing stones or pulling tails. 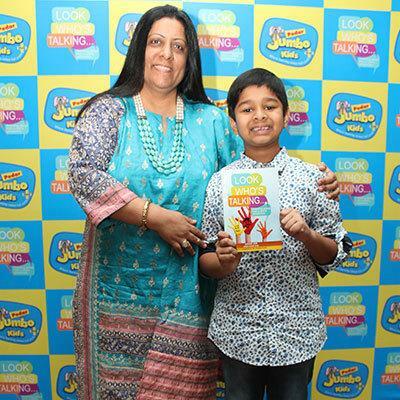 This Republic Day, educationist Swati Popat Vats launched a book called ’Look Who’s Talking’ (co-authored by nine-year old Shiven Jain, an ex-student of Podar Jumbo Kids) on how to explain the values espoused in the Constitution of India to children, she cautions that these very values are being eroded in society at a fast pace. She shared statistics from a life skills survey on 900 kids, aged between five and seven. The survey has revealed surprising findings on how the core human values like sharing, caring, nurturing, enjoying, empathy and learning have now been replaced with more selfish attitudes like greed, laziness, envy, recklessness and apathy. Education experts fear that this shift in values will not only impact kids but will, in later years, impact society’s structure and stability. Q 1. How has parenting changed in the last 10 years? Why has this change occurred? Swati Popat - Previously it was based on what parents learned from their parents, so imitating the old style without question. Parenting is an instinct; you cannot be trained to be parent! And parents have lost connection with this instinct as they are depending more and more on ‘what others do’, ‘leaving their kids completely to others to care for’ and getting confused with the vast influx of material available on the net on parenting. Dr Vaidyanathan - Parenting keeps changing practically every year, but I would say that the real quantum change has happened over the last 20 years. Around 1995 is the time when computers and mobile phones got introduced to India and ever since there has been no looking back. The need for the mother to work and contribute to her own growth and to the financial enhancement of the family has become a norm, rather than an exception. Also, a large number of parents are often stopping with one child. As a result of all these changes, children are being forced to grow up and mature, and become responsible much faster. Their childhood is slowly getting lost. Q 2. In today’s world, what do parents wants most for their kids, what are the expectations from kids. Dr Vaidyanathan - Education has become the yardstick by which children are being measured. Apart from being a genius at school, the child is also expected to excel at one or two sports, in the fine arts, and in some other activity. Expectations are sky high, and children are under tremendous pressure to live up to these expectations. Parents also expect their children to be well behaved, respectful, observe discipline, to eat and sleep well, and basically to cause as less trouble for the parents as possible. Q 3. We hear about different types of parenting getting prominence in the world, like helicopter parenting, tiger parenting etc. What is your take on this? Dr Vaidyanathan - There are many parenting styles which are described—helicopter, tiger, authoritative, authoritarian, lenient, negligent, permissive etc. But the point is that parenting is a case of one shoe does not fit all. Each child is different—physically, mentally and emotionally, hence one cannot suggest any single type of parenting to be good or bad. Parenting is a dynamic job, and the parent needs to assess and understand the child, find out his pluses and minuses, and act accordingly. Most parents bring up their children exactly the same way as they were brought up, or in the opposite way. They engage in black and white behavior, while most of parenting falls in the grey area, where minute to minute decisions and changes need to be made, to fit the child. Swati Popat - Call it by any name helicopter or tiger, these are actually negative styles of parenting, also known as ‘authoritarian’. So they are too permissive, or hovering and demanding. The better style would be that of balance, trust, and confidence which is ‘authoritative’. Psychologists have consistently related children’s intellectual and academic success to the environment created and parenting style of parents. Parents who have a balance in their parenting style of being more nurturing (physically affectionate, emotionally supportive), and involved with their children (consistently spend time in shared activities), and are highly responsive to the needs of their children (accept their individuality, serve as consultants to help them solve problems), but at the same time are also demanding (expect mature behavior and independence, set clear standards and rules and see that they are followed), have a higher chance of happiness of their children and intellectual and academic success. Q 4. Today’s children are slowly moving away from going outdoors and spending more time with electronics or TV – what is your advice to parents on this matter? Dr Vaidyanathan - Since parents are working in most households, the mobile or television engages the child and the parent is not needed. Any other form of activity—indoor or outdoor—requires the parents and other children. I would like to applaud concepts like OKZYromon.com, which understand that life has now predominantly shifted indoors, whether we like it or nor, and have come out with interesting and engaging concepts, where the child’s growing brain and intellect is stimulated, where the parents and child can do a lot of activities together, and where the child’s desire and interest in doing, reading, discussing, planning, challenging himself or herself, and cooperating with siblings, friends and parents is taught in a scientific way. Parents basically need to shut their mobiles/tablets and lead by example by interacting with the children in more creative ways, indoors and outdoors. a) Children lack impulse control and self-regulation (which is will power) so you need to make the rules for TV watching. b) Early exposure to TV results in damage to brain wiring that will result in later learning and behavior problems. No TV before the age of 2! c) TV damages verbal and social skills of children. Children learn language by responding to caring and nurturing adults and to conversations. TV is a one-way process; you don’t like what it is saying? Use the remote and change channels! d) TV programs that have violence are particularly bad. Because children learn by imitation, they imitate the hero’s hitting, punching, pulling, and kicking. The moral or lesson learned is that physical force and aggressive acts are not only acceptable, but also necessary to win. You can change this negative impact around, by limiting TV time and content watched and by watching a program along with your child, creating opportunities for discussion during the program. Ask your child probing questions like during the TV program, such as “What’s Chota Bheem doing?” or just by commenting to your child, “Mummy did not like it that Chota Bheem was fighting”. Q 5. What is the number one thing a child needs from a parent during the formative years? Swati Popat - I would like to quote Rudolf Steiner German philosophist and educationist, who has written extensively on parenting. According to him there are three important stages in our life- infancy, childhood and adolescence and parents need to understand what children need during each stage. They understand ECONOMIC and so need pocket money etc. Q 6. There is a lot of discussion on the ‘Spare the rod, spoil the child’ saying. What is your take on this matter? Dr Vaidyanathan - Physical violence or spanking is a definite no no. The biggest problem with hitting a child (which, incidentally a large proportion of parents still do) is that it teaches the child that violence is okay. Also, beating or spanking a child loses its effectiveness after some time. The child becomes insensitive to the pain, and often is seen to challenge the parents to hit him, saying it does not pain and he doesn’t care. Then a parents does not know what else to do. Swati Popat - I believe children who are brought up with beating, screaming as a routine will grow up beating, screaming as their only known solution and children grow up to be adults so this continues as part of their coping mechanism throughout life. How you bring up your child can indirectly impact world peace. Sometimes these styles or methods may in fact open up the child to dangers such as punishments, threats, and even keeping secrets from parents. For example if parents use hitting or corporal punishment to discipline children at home and it works then no amount of cajoling or motivating by teachers will help them behave in school and pedophiles of people who mean harm to your child will find it easy to threaten your child with the same. Q 7. What is your advice to working moms and dads with young children? Swati Popat - Be there for your child. Call up your child at least 4 times a day and don’t ask if they have eaten or done their homework that is interrogation! Instead have a conversation. Share what you ate for lunch, talk about your day and pause and they will talk about theirs. Very young children just need to be told that they are loved. Don’t miss their important days and events, both at home and school. Dr Vaidyanathan - Don’t carry your work home. Don’t make promises that you cannot keep to your child, due to work pressure. Don’t lie to your child. Tell them the truth, if you have too much work and can’t play or talk to them. Excuse yourself and promise to make amends. Explain to your child, as soon as you think he or she is old enough, why both parents need to work. And don’t worry—seeing you work hard, they too will learn the value of hard work and application. Q 8. To conclude, tell us the one-thing parents need inculcate in their kids from the very earliest stage of life. Dr Vaidyanathan - The one thing that parents need to inculcate in their kids, from the beginning, is love, and a high sense of self-esteem and self worth. A child with low self-esteem is also more likely to have behavioral problems, be prone to depression and to drug and alcohol abuse. The most important thing you can do for your child is to love him or her unconditionally, and to raise their self-esteem and self worth very high.